The Wait for Process action waits for a given process to start or finish, or alternatively for it to open or close a window. For an overview of "Wait For..." events, including specifics of the Wait Options, see this topic. The process can be specified by Process ID or name. Process exists - The process is running in the system. Window found - A window matching the "Window" description has been found. Window not found - No window matching the "Window" description was found. 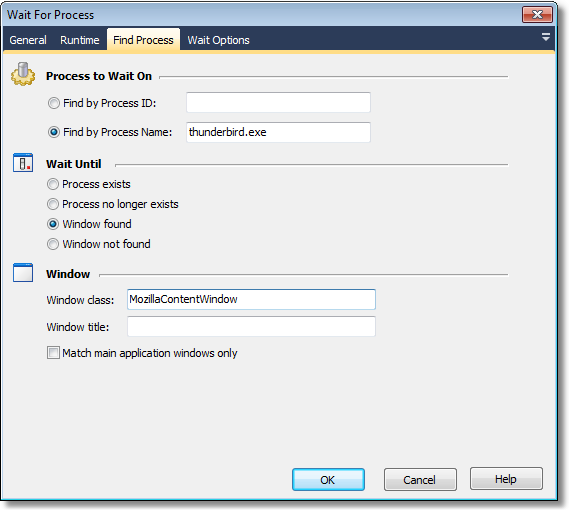 If both Window Class and Window Title are left blank then the Wait for Process action will match any window belonging to the relevant process. Alternatively, if the process name and ID are left blank then the Wait for Process action will match windows that belong to any process. Check the "Main application windows only" box to only match main (ie parent) application windows. If the box is unchecked, all child windows will be searched. See the Waiting For Events topic.